Appreciation awards can be an effective way to say "Thank You" and show someone that you've noticed their hard work. This can be accomplished with the help of a few thoughtful words on an appreciation award. Your choice of words you use to compose your message reflects the award atmosphere. Some features should always appear on awards such as the recipients name and the date the award is given, but others, such as the message, are left up to interpretation depending on the award. If you follow some basics listed below, the task of composing a concise and meaningful message is not all that hard. The W’s of an award: What, Who, Why, When, and Where is an easy formula that will help you to remember what elements to include in an award composition. What is the award about or who is presenting the award? (The Award Title). Who is receiving the award? (The Award Recipient’s Name). Why is the award recipient is awarded? (The Award Message). When and Where is the award presented? (The signature). (The text coloring scheme in the example below is used to show the different parts of the awards content and is used throughout this document for that purpose, it has nothing to do with awards’ layout designs). The award title is usually engraved at the top of the award, it is the award headline, it can be either the name of the award such as: “Achievement Award” or the name of the awarding organization such as: “University of California” or a combination of both such as: “XYZ Paints Co. Employee of the Month Award”. such titles let anyone who sees the award know what the person is being recognized for in general leaving the specifics to “The Award Message” section. In this case the name of the awarding organization is implied in “The Signature” section at the bottom or by having a company logo on the certificate. The presentation line can be skipped. 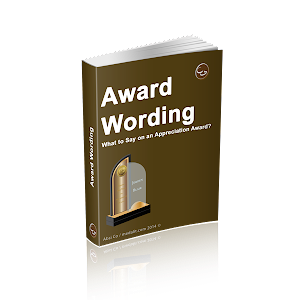 In some cases the award text starts with an expression or word like: “Recognizing”, in such cases the presentation line is not used. This is simply the name of the person, persons, or group receiving the award. Awards should have the recipient’s full name on them. In some cases the recipient’s official title/office is also included. However, the recipient’s name on the award can vary depending on the occasion it is given for. The basic way to write a name on an award is just to list the recipient full name. Don't include an honorific such as Mr./Mrs./Ms./Dr. it emphasizes that the award is for them without reference to any office or position they might have held. When you include other information -- honors, academic post-nominal abbreviations, courtesy titles, and personal ranks -- it shifts the emphasis to their role / professional activities. e.g. The Honorable Albert Arnold Gore, Jr.
For office awards, put the name that a person goes by around the office. For example, if a person’s name is Robert, but he goes by Bob, you should put Bob on the award. If the award is for a fun occasion between friends or a sports team, you can put a nickname on the trophy. For example, if someone’s name is Jane Smith, but her nickname on the team is “the Jet,” you can put the name as Jane Smith “the Jet” on the trophy. In some cases the recipient's name font size is made to stand out as much as or even more than the title. Double-check that you have the correct wording and spelling of the recipient's name and, if applicable, his official title. Read more. The award message can be as generic or as personal as you like. You can compose this section by answering this question: Why the award recipient is awarded? The reason for the award must be explained here. This could be a simple statement such as: “Best in sales for the year” or a lengthier paragraph outlining specific characteristics or achievements of the award recipient. However, do not be afraid to put the message in your own words to give it a personal touch. Read more. Steer away from using jargon or acronyms that are not commonly used in the English language. Avoid using “puffed up” words that seem phony. Use simple, everyday words that convey sincere thoughts. Awards do not have much room to write messages, so make the most of the room that you have and keep the message simple. Decide how the date of the award should appear on the plaque. Is the date for an accomplishment that took place on a certain date or is it for cumulative achievements made during a month or a year? Should you record the date of the accomplishment or the date the award was given or both? For consistency purposes, if applicable, look at how dates are typically printed on awards in your organization. Read more. Management and leadership awards may be named after an important individual in the organization's past, such as a favorite past Board Member, Founder and President. The award may also focus on a particular skill set such as new product introduction, mentoring, strategy, or new market penetration. It can also focus on the company values, and be awarded to the individuals that best embody these values, such as diversity,excellence, respect, or innovation. Many of these awards are tied to a favorite saying of the leader or manager, or a reference to a particular success under their management. Successful completion of an acquisition, mergers, divestitures, product launches, attainment of a new revenue level, reaching a particular level of production, successful reorganizations, patent achievement, and more are all commonly given management and leadership awards. It is also common to recognize executive level leaders with gifts or special awards when they are moving into a new position, leaving the company, or retiring. For Your Exemplary Leadership And Vision. Our Organization has Prospered under Your Guidance. A retirement award conveys respect, appreciation, esteem and the value that an employee had within the company. Often times, the retirement award will be presented at an employee meeting, special luncheon, or retirement party. It is a good practice if the company decide to have a commemorative plaque made with the individuals work accomplishments made to hang in a Hall of Fame at the corporate office, showing customers, vendors, and new employees how much they value long term employees. To choose an appropriate award for a retired employee, you may want to consider: The personality of the individual, the type of position, the number of years worked and the type of company. what was in your bank account. and for the hugs we so often needed!